Grecia is an ABA Therapist who provides services for individual and group therapy clients. Grecia received her B.S. in Communication Sciences and Disorders, Speech-Language Pathology from the University of Texas at Austin in 2018 (Hook ‘Em Horns)! She has worked as a childcare provider for the past seven years. Grecia also volunteered at a Kaufman Apraxia Bootcamp at the Carruth Center in Houston, Texas, where she assisted with a speech-language based group therapy program designed to increase speech formulation, automaticity, language content and structure for children (up to age 6) who have apraxia of speech or phonological processing disorders. Grecia plans on continuing her education by getting her Master’s in Speech-Language Pathology. 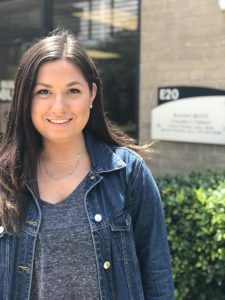 Grecia has been working at Building BLOCS since July 2017. Grecia is currently finishing up hours towards her Registered Behavior Technician certification and plans to sit for the exam within the coming months. Grecia’s areas of interest include autism spectrum disorders, early intervention, augmentative communication, fluency, articulation, and voice disorders. In her free time, Grecia enjoys spending time with her friends and family, traveling, swimming, and playing with her unusually large chocolate lab, Marcelo. Grecia has loved her time at Building BLOCS and is excited to learn more about the fields of ABA and speech therapy during her time here!